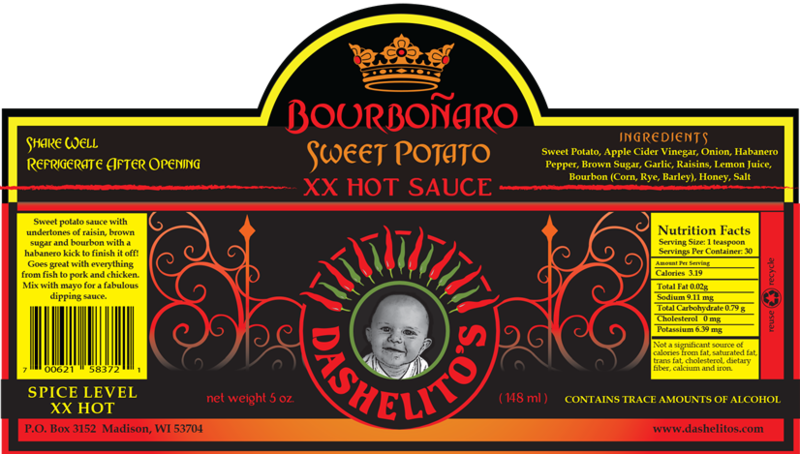 Sweet potato sauce with undertones of raisin, brown sugar and bourbon with a habanero kick to finish it off! Goes great with everything from fish to pork and chicken. Mix with mayo for a fabulous dipping sauce. ***Shipping and handling will be $2.00 per order and $1.00 per 5 oz. bottle. The more you order the more you save! 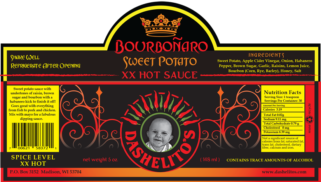 Dashelito’s Bourbonaro Sweet Potato Hot Pepper Sauce has undertones of raisin, brown sugar and bourbon with a habanero kick to finish it off! Goes great with everything from fish to pork and chicken. Mix with mayo for a fabulous dipping sauce.